It was in the Mournes I learnt that there is no better way to know the nerve of a mountain than by walking up a stream to its source. And by that I mean walking in the stream. Every step is a watery one, and every stone is a friend, and the goose-flesh of Mourne granite is a friend indeed to the slippery bare foot. Shallow rapids, ferny clefts, deep dark pit-brown pools, flashing tails of spray – all take on a new inward look. Boulders with the sweep of a bells’ shoulders. The nice thing about stream-climbing is that it can be done pleasurably on a rainy day for there is a point at which wetness seizes to matter and becomes exhilarating. But a blazing day is perfect for the job, and if you carry a geological ordinance survey map there is the added pleasure of maybe finding a vein of greenstone or a band of diorite that has not been marked on the map. The picture is of the Central Mournes seen from above Hilltown where the infant River Bann begins to put on weight. Above Hilltown it is of no great account so far as angling is concerned, through it’s ideal spawning beds. But below Hilltown there are many fine – and free – reaches where brown trout may be taken. Indeed the Upper Bann is one of the best trout streams in Northern Ireland. 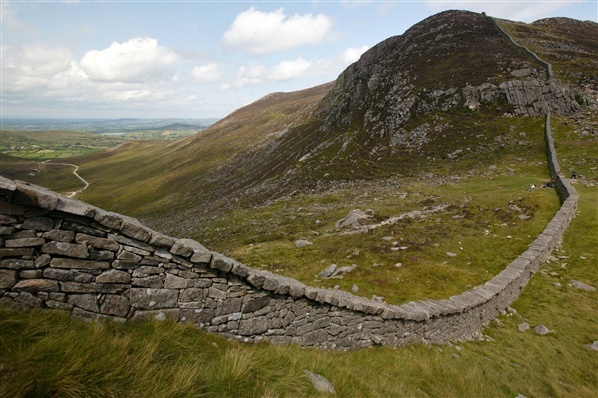 The Mourne Mountains are a must see attraction on your tours of Ireland.